Didn't dig any pits, but could see at least 2 minimum distinct melt layers in snow along the river bank. Slides all hit within a few minutes of the sun coming out. Aspect of the avalanche source was unknown, but likely west facing. We were in a north facing gully at the base of squash head ice climbing. 2 slides went off in our gully within a couple minutes of each other. 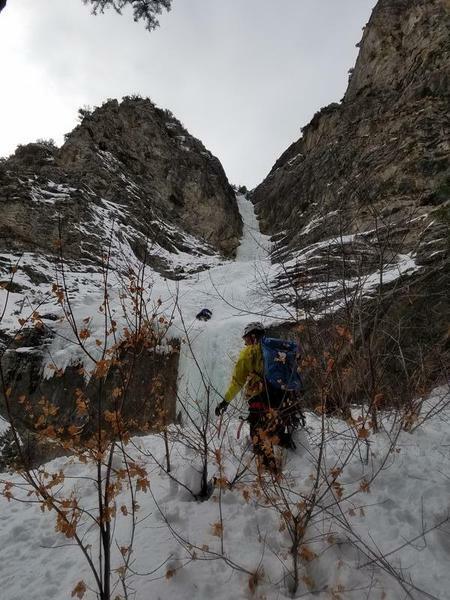 3 slides in a neighboring gully at the same time. 3 of us hit by the debris, but none buried. Numerous climbers nearby. No one buried in our area. Around 11 am. Temperatures roughly low 40's. 1 climber on the route was hit by much of the avalanches but was unhurt.